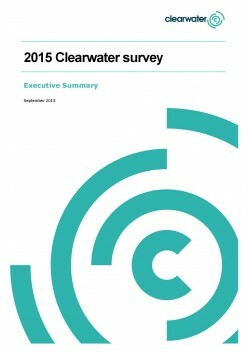 In May/June 2015, Clearwater sent out an online survey to collect industry feedback on (1) Drivers, barriers and challenges relating to the implementation of Integrated Water Management (IWM), (2) Clearwater’s current service performance and (3) communication and learning preferences. A total of 116 respondents from Victoria and new South Wales contributed to the data. Overall, Clearwater is seen as providing high quality value-for-money services . Clearwater was rated highly for building individual and organisational capacity in IWM, with respondents agreeing that Clearwater services: had an impact on their personal knowledge; benefited their organisations; and, helped to develop their networks. Across all respondents, the top 3 sources of information and advice were ‘personal networks’ and ‘people in their own organisations’, followed by capacity building programs. Communication channels such as emails, e-newsletters and face-to-face communications scored high, and respondents showed a clear preference for learning methods involving face-to-face contact. This report summarises the survey’s main findings.